Tous will launch H20, a new "ecochic" perfume for women inspired by the brand's H20 jewelry collection and "born from the desire and conviction that a more just world is possible, and that the union between beauty and sustainability is yet one more step towards a more beautiful universe". The glass bottle is 25% recycled glass, the fragrance's packaging and handling is carried out by the Special Employment Center of the Arco Iris Foundation using materials certified by the Forest Stewardship Council, and a portion of the proceeds will be donated to Intermón Oxfam to "provide drinking water for the people who need it most". Tous H20 is an aquatic fragrance developed by perfumer Sonia Constant, and features organic alcohol with notes of organic lemon, organic lavender, rose, jasmine, mandarin, cedar, white amber and Australian sandalwood from sustainable development. Exactly what I was thinking! Not very interested in the juice, but the bottle seems just perfect for an aquatic fragrance. Oh, well, I don’t display my bottles anyway. True, perfect for an aquatic. Robin, that jewelry is lovely. Any purchasing info on those? No, in fact, as I said I can’t find them on the Tous website. Maybe it’s an old collection?? Looks a lot like Shi. I am not into the juice, but I love the concept of sustainability, and that they are using recycled glass! Yes, nice to see more companies jumping on the sustainability. This is not a summer version of La Prairie Midnight Rain? Maybe Midnight Summer Rain? Whew, hope not. Not my favorite perfume. … with a dash of VC&A Feerie!! Wow, gorgeous. Those fragrance notes seem curiously warm for an aquatic… I wonder what it will be like? Guessing it will be more cool than warm. I’m going against the grain: Great concept, but I don’t like those bottles. The fragrance sounds fairly generic but who knows. The price points are really good at €66, €48 and €32. Oh, and it’s a Catalan company, which makes me like them more. Too girly? Bad color? Just plain ugly? 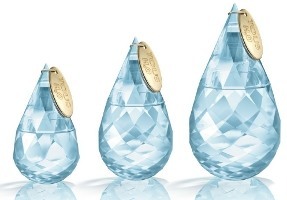 I’ve certainly seen worse bottles (Rykiel Woman) — these are just kind of benign, faceted crystals. I guess I’ve had enough of that because I bought a couple when I was dabbling in feng shui. If anything, they’re just nothing special to me, bordering on tacky, not truly ugly or anything. Just not a huge fan of crystals. I don’t like ’em either. They look like the love child of JLo’s Deseo and a cheap Silver Rain flanker. Call me an old curmudgeon, but that list of words like ‘sustainable’, ‘certified’, ‘special employment’ and ‘stewardship’ give me a dull, sad feeling that this will turn out be a worthy Project, with the juice being pretty much irrelevant. I bet the idea is that you buy it for eco-aware friends to show your eco-credentials, and it will sit on a dresser for a few months before beginning the thrift-shop circuit. I do hope I’m wrong. The bottle is based on a jewellry collection by Tous called H2O that was made exclusively for charity: the benefits were destined to Oceana. The collection was a big hit, so it’s totally sold out, which is a pity, because it was beautiful: simple, pretty pieces in gold, silver, blue silk and blue topaz. The bottle and the little gold plate at the cap resemble that collection. As the jewellry collection gave money to a charity that works with the seas, the fragance will give part of their benefits also to a water – related charity. In this case, to Intermon Oxfam, to help build water wells in Africa. omg, I have to have a bottle, just for the bottle. I checked the prices and they are reasonable. I also think the notes sound rather warm. Sandalwood, cedar, amber. It sounds rather interesting, though. But the bottle! LOVE. Yes, nice to see more companies paying heed to these issues…Nautica Oceans is along the same lines. With the inclusion of lemon and lavender, I wonder if it’ll be soapy? Cedar, white amber and sandalwood seems like a replacement for authentic ambergris, which would’ve been very oceanic. The Australian sandal is drier and not as creamy as the Mysore (I know that Australian is sustainable, while the Mysore isn’t), but I think this would work better for an aquatic, anyhow. Does anyone else notice how much drier/more astringent australian woods, wines and flowers are than their international counterparts—at last, as ingredients in products? I personally love that texture—you can almost taste and smell the sunbake. Oh, organic stuff is right up my alley but it can’t be auqatic if it is organic. it can be fresh or watery, but not aquatic in the sense davidoff cool water is, which is a in-your-face-aquatic. or am I wrong with the (english) term? It has some organic ingredients, but it isn’t all-organic, or even all-natural. i love that bottle, wonder how much it would cost? See Joe’s comment above…he lists the prices. Has anyone located this yet in stores? I am curious to check it out and luv the bottle. I haven’t seen it yet, but then, I don’t actually know any stores near me that carry the line. I contacted the Tous website, it is supposed to be available in September. The only stores that I have saw the line in is Dillards Dept. Store. I hate when they release a scent that you might want to purchase and you can not even smell it. Yes, forgot about Dillards…but I don’t have a Dillards near me, unfortunately. looking to buy tous h2o immediately. can you help me find a 100ml bottle? I don’t know who is selling it, sorry.